Dynamic Discs is excited to announce that we have reached an agreement with Paige Bjerkaas for the 2019 and 2020 seasons! 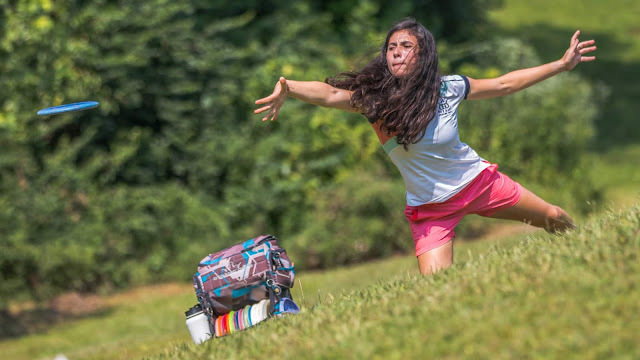 Bjerkaas has played for Team Dynamic Discs since 2009 when she was in seventh grade, and she has collected multiple wins since, including the 2010 Junior World Championship. In 2018, Paige faced a difficult decision - return to Emporia State for the fall semester or stay out on the road for the remainder of the year. Ultimately, she chose to tour for the remainder of the year, and most would call it a life-changing decision, resulting in winning the FPO 2018 World Championship. If you want to join us in supporting Paige, pick up one of her signature Fuzion Judges or special stamps now, or you can grab a Lucid-X Getaway in 2019. We’re proud of you, Paige! oh my goodness looks like one of my young nieces beside that thing. Stay safe and warm.